Just this year, three of the State Department’s most experienced diplomats on Latin America have resigned: Tom Shannon, the No. 3 official in the department; John Feeley, the ambassador to Panama; and Mrs. Jacobson, the ambassador to Mexico, who will leave her post in May. Their departures have coincided with a marked increase in hostility from Washington toward countries in the region. Public fights with Mexico, vows to end relations with Cuba, suggestions of intervention in Venezuela and a high-profile exit from a major regional trade deal, the Trans-Pacific Partnership, have signaled a sharp change from what had become a rough consensus in Washington over the last two decades: a softer, friendlier approach to the region and a belief that American interests would be better served through alliances. Police officers outside Mexico’s Foreign Ministry after the arrival of Jared Kushner. “I don’t know if the new administration is just turning back the clock or just doesn’t give a damn,” he added. Mr. Trump’s stance toward the region appears to be driven as much by domestic concerns as anything else, experts say. On Cuba, Mr. Trump appears to be catering to political supporters in Florida who helped get him elected and who oppose warming relations with the Communist government. On Mexico, the calls for tearing up trade deals, building a border wall and deporting people respond to American frustrations over immigration and jobs, building on the promises Mr. Trump made on the campaign trail. The change in diplomatic temperament toward Mexico breaks with what historians and analysts describe as a 25-year project to draw the two nations closer together, including through the free trade deal that Mr. Trump has threatened to end. Heather Nauert, a spokeswoman for the State Department, said that Secretary of State Rex W. Tillerson had “a demonstrated record of engagement with Mexico,” noting that he had gone there twice during his tenure. 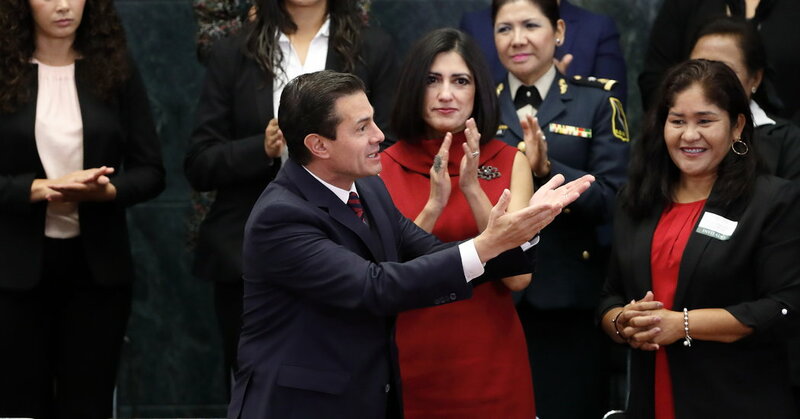 “Mexico was the secretary’s first bilateral trip overseas,” she said. From early on in the Trump administration, Mr. Kushner was cast in the role of managing the strained relationship with Mexico. For help, Mr. Kushner has relied heavily on Luis Videgaray, the Mexican foreign minister and perhaps the closest adviser to Mr. Peña Nieto. The two advisers have met more than a dozen times since Mr. Trump took office, including during many of Mr. Videgaray’s 15 trips to Washington. The men have largely been the brokers of American engagement with Mexico, often cutting out State Department experts and the United States Embassy in Mexico. “This visit is just a reminder that this is a new, unstable bilateral relationship, with ups and downs, slaps, blows, talks and recovery,” said Raúl Benítez Manaut, a professor of international relations at the National Autonomous University of Mexico. President Juan Manuel Santos of Colombia, left, with Secretary of State Rex W. Tillerson in Bogotá last month. Mr. Tillerson stressed the need for the country to crack down on coca production. South America has also presented headaches for the White House as it shifts from the policies of previous administrations. Last August, Mr. Trump said he would not rule out military intervention in Venezuela. The White House has also issued wide-ranging sanctions against Venezuelan officials, including President Nicolás Maduro and his vice president, and threatened economic sanctions that would cripple a country whose economy has already collapsed. The remarks dogged Mr. Tillerson throughout his trip and have made it more difficult for Latin American countries to pressure Mr. Maduro without appearing to serve Mr. Trump, experts say. “This gives Maduro a political gift,” said Michael Shifter, the president of the Inter-American Dialogue, a policy group in Washington. He said the White House statements backfired, by allowing Mr. Maduro to attack the political opposition as American lackeys. Mr. Trump’s shifts toward Colombia have been equally apparent. Colombia is the strongest American ally in the region, the recipient of roughly $10 billion in anti-narcotics aid from the United States. For years, American diplomats and Colombian presidents have largely been in agreement that the drug war was best fought by a mix of targeted crackdowns against drug traffickers and measures to improve the lives of ordinary Colombians, like trade deals and state building. But that’s not always so in the Trump administration. 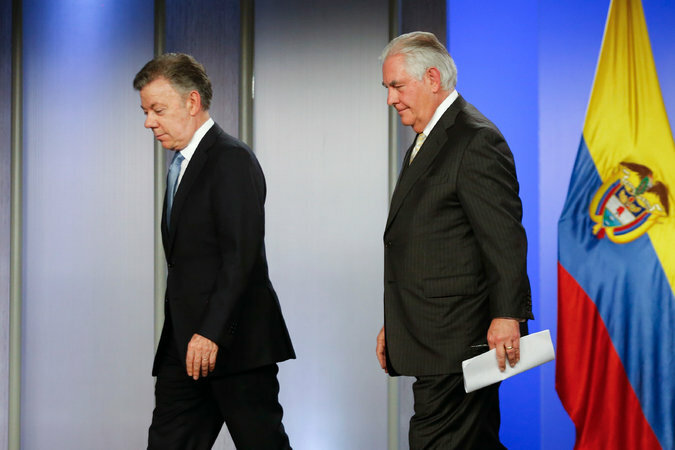 During his visit to Colombia in February, Mr. Tillerson repeatedly stressed the need for the country to crack down on coca production, and made little mention of plans to rebuild Colombia after its landmark peace deal with the nation’s main rebel group. Even relatively stable countries have found themselves in the cross hairs. It generated a strong response from Peru’s trade minister, who came to China’s defense. “I appreciate advice, no matter where it comes from. But we’re careful with all our trade relations,” said the minister, Eduardo Ferreyros.